golden age. And still is. 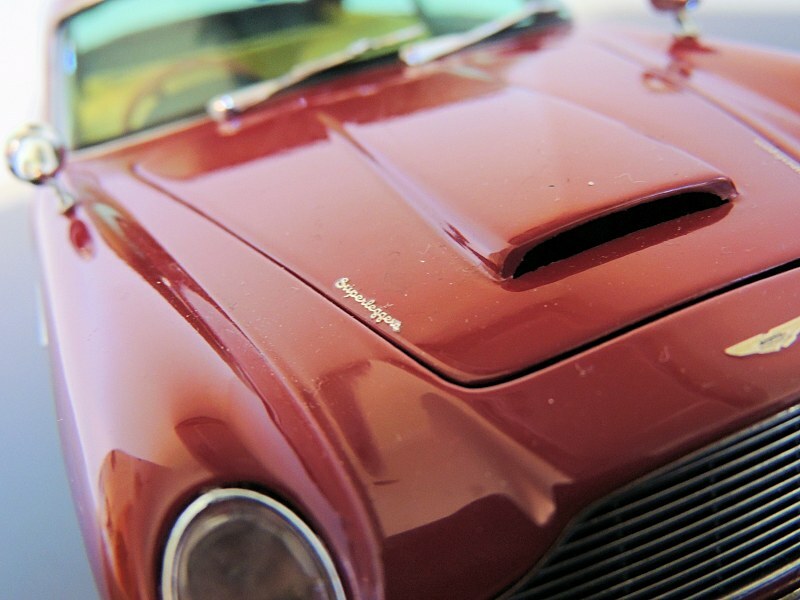 Fifty years later, it remains the epitome of Aston Martin, familiar to everyone from the car buff to the James Bond junkie. It doesn’t need a sign at rallies, it doesn’t need a caption in books – one glimpse of that magnificent exterior and the word ‘Aston Martin’ is all we need. And of course, we also need a model of it. 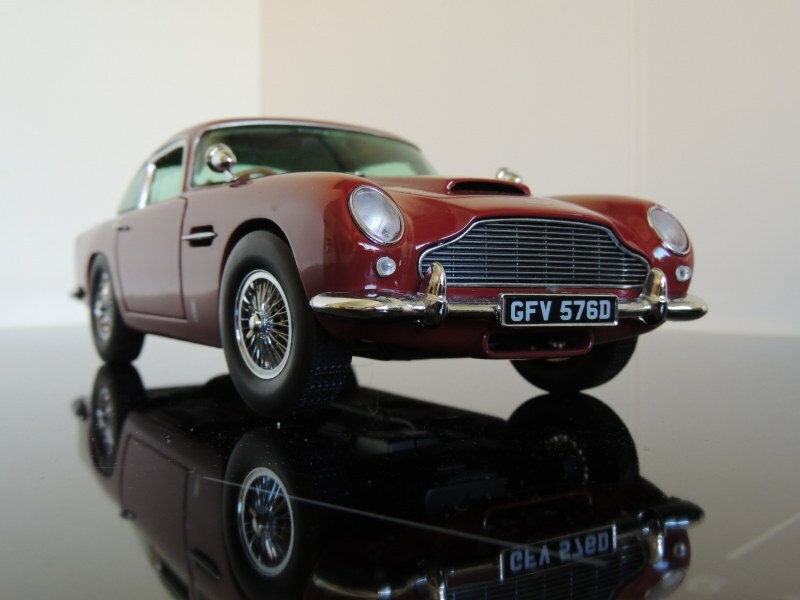 The better model DB5 would be the 1:18 one by AUTOart, except for the fact that they just stopped producing it. So the only remaining option, at least in 1:18 scale, is the Sun Star one, reviewed here. 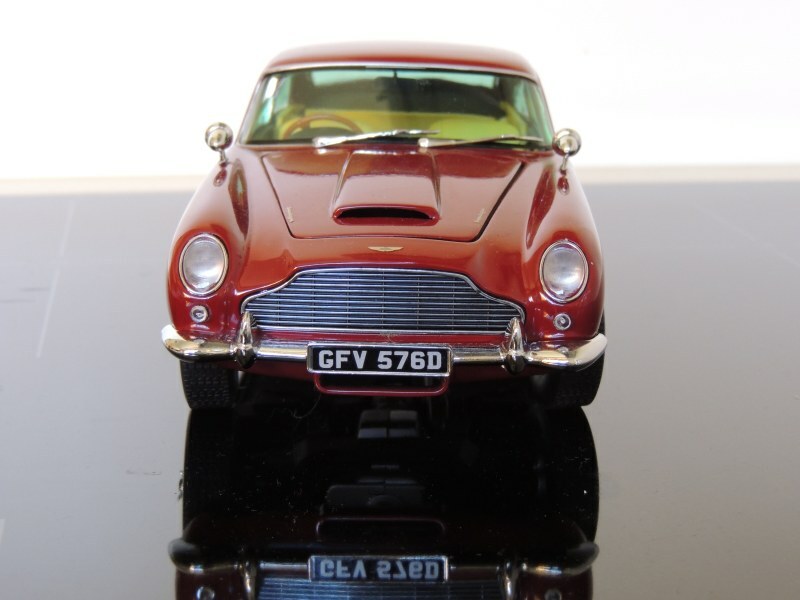 Available in four different colours (British Racing Green, Silver Grey, Blue, or Dark Red), with complementing interiors, we should have been spoiled for choice had there only been one with fold-out guns and a Skyfall backdrop. Taking the model out of the box can be a little disappointing though, in part because of the ominous structural failure of the box (Buy some Loctite glue with this one). 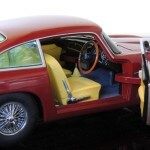 One of these disappointments concerns the fact that the boot actually does not open – considering that Bburago can make this happen on their $50 models, Sun Star can certainly make it happen on their $100 models! Another fault is that the car sags due to a broken clip; more of an individual problem, yes, but it still reveals a quality control issue. Despite this, the exterior of the model does look rather stunning, with its well applied paintwork and detailed craftsmanship. 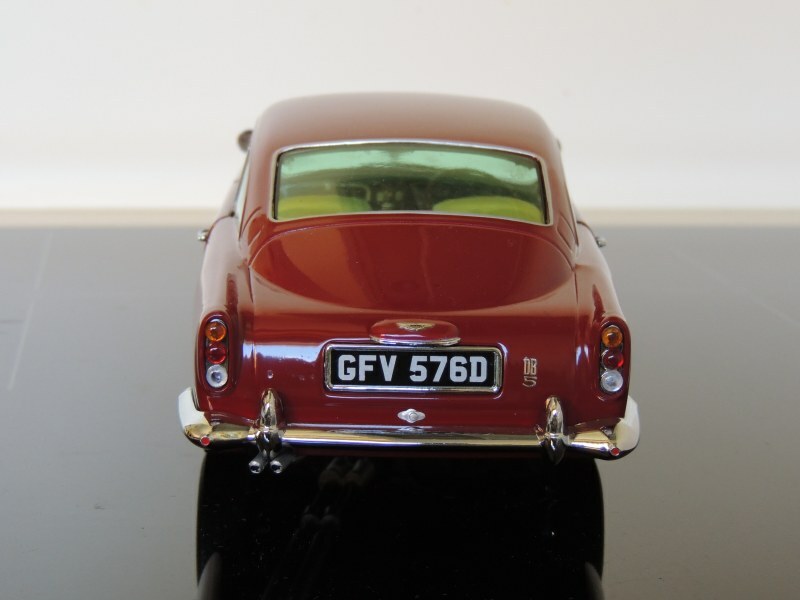 The ‘Aston Martin’, ‘DB5’ and ‘Superleggera’ badges are finely rendered, as are the wire wheels, the head/tail lamps and the other exterior ornaments. It is also quite heavy, weighing over 6 kilograms. A very nice paperweight then. 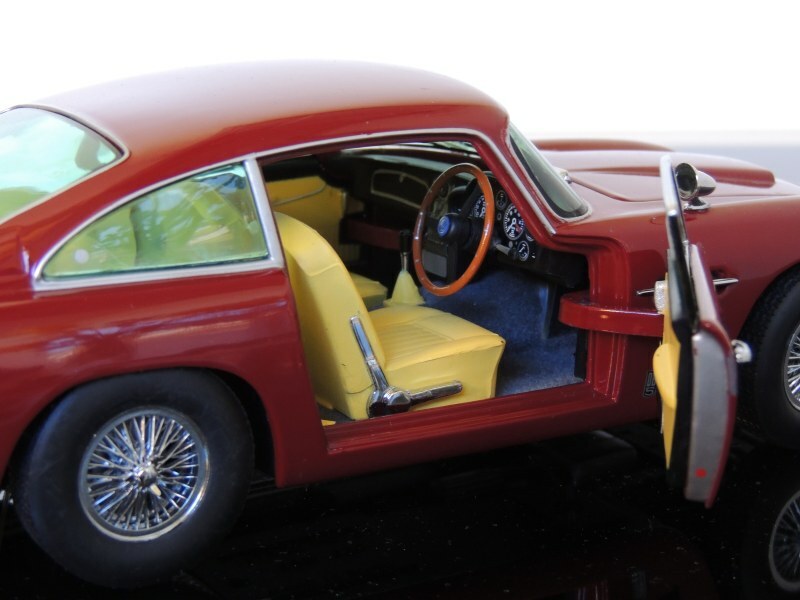 The DB5’s interior, however, does not entirely live up to the class and craftsmanship of the exterior. For one thing, the upholstery is a blazing bright yellow! Black seats good, beige seats excellent, but yellow seats? Yellow should be confined to replicas of the French. For another thing, the centre dash console has a gauche glue mark across it, resembling a piece of sticky tape. Again, an individual problem, yes, but it still reveals a quality control issue. 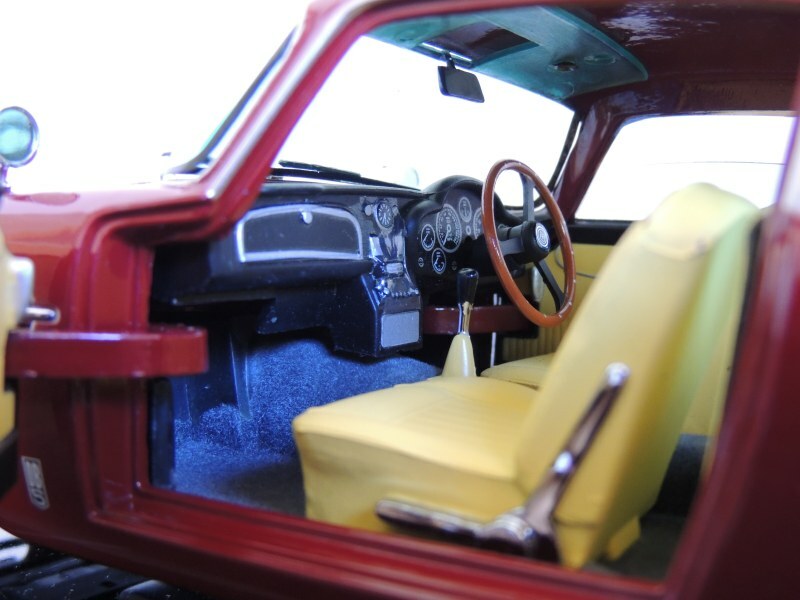 The seats also have a very thin coat of paint, and with a black undercoat, you can imagine what the effect is when a fingernail scratches it, back at the factory. Lastly, the carpet, while lovely in some areas, does not go all the way up the foot-wells. Look closely and you’ll see that it stops halfway – not consistently either, but in splotches. Yes, it’s presentable, but not commendable. Unlike under the bonnet, which is rather commendable. 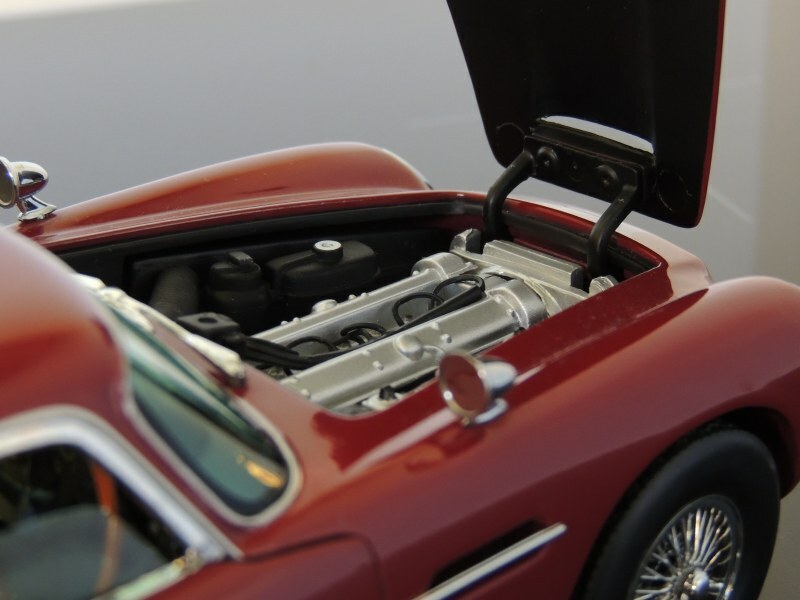 The plastic used for the engine and mechanics is dense and good quality, and it is all nicely painted and presented. Part and parcel of this, the underside of the bonnet itself is painted in a matte black, and not just left as exposed metal. My word, it’s good. And as a whole, it is a good model. If you can overlook the blemishes, you will find a charming model that looks stunning in the cabinet, on the book shelf, or even on the toilet window. 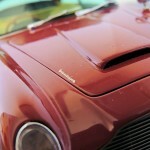 It doesn’t matter where–“one glimpse of that magnificent exterior and the word Aston Martin is all you need”. 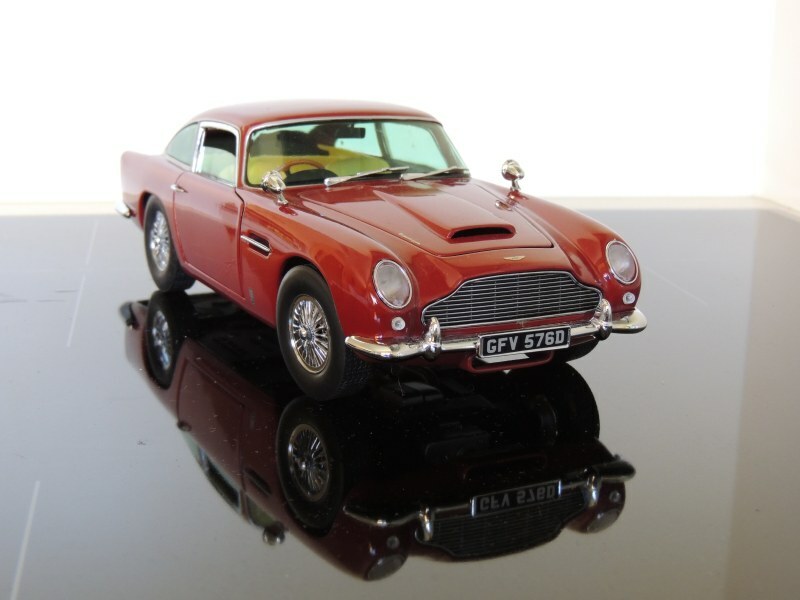 5 Responses to "REVIEW: Sun Star 1963 Aston Martin DB5"
Correct me if I am wrong, but I believe it’s a reissue of the Chrono model. The first edition of the Chrono model was launched 15 to 20 years ago, the Chrono had even a pull back system under the backseat, that’s why the boot didn’t open. The Chrono model is similar in many respects, and it’s obviously modelled off the same vehicle (#GFV576D) as the Sun Star. However, the two differ particularly in quality of finish. For example, where the Sun Star has clear headlamp units, the Chrono has ugly studs. The Sun Star has a well-finished engine, the Chrono has a tacky engine with poor paintwork. And while the Chrono had the childish function of pull-back to prevent an opening boot, the Sun Star has no such excuse. Therefore, I maintain that Sun Star should have done a better job regarding the function of the boot, considering it does have a relatively high price. Very budget model, even AutoArt is stopped producing, models still available in stores … just price is high. On many occasions I have considered replacing my beautifully painted but ancient Autoart DB 5 one of the 1st pieces I paid over $50 for….Imagine , an Autoart so old it has no flocking, no plug wires, no tilting seatbacks but the quality of whatever is there speaks volumes about the company that has become the elegant, and extremely detailed Autoart we now know !! I’ve examined many Sunstar and Chrono DB5’s because my old Aston has a broken wire wheel that will require pin vise hole and metal pin, and the most extremely delicate placement and gluing of the inner wheel ,wire placement I must say though that your review of Sunstar the pics that illustrate the differences ,and the ancillary info about Chrono have convinced me as I look at the still gorgeous deep paint ,(still NO FLAWS ,or bubbles ,nada !!) the very hi quality plastic that’s been used to replicate to a great degree ,carpet leather, and a dash that far exceeds the decal plate I saw in pictures Anyway I do seriously appreciate the advances Sunstar as a co. has given us in Platinum series cars, but I just can’t get past that stellar quality of that OLD OLD Autoart ! I just can’t close without mentioning ONE MORE THING . To this day I have never seen Chrome as deep ,or lustrous that pleases me more to look at as is on that Aston Martin DB5 from the very early days of Autoart…………Guess I’m fixin it , HUH ? ?